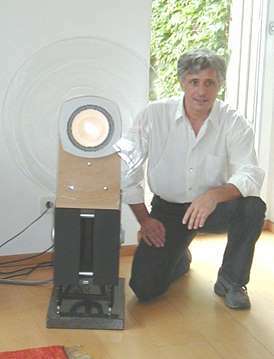 At the end of 2004 Axel Ridtahler invited music lovers to listen to his latest creations and to comment and discuss their impressions. Axel Ridtahler presented full range drivers with exponential horn (front loaded) made of acrylic glass. Both, full range as well as bass, work like an open rear, dipole system. The horn ensures a vivacious, lively sound and provides - due to the virtual baffle extension - a perfect link to the subwoofer system at around 150 Hz. And besides, the dipolar radiation over the entire frequency range assures an extremely well balanced sound projection, forming a uniform and integrated whole. The full range sounded extremely convincing, vocals were delightful, a homogenous sound as one would expect from good drivers of this type. The bass is a special treat. It's a variety of the dipole transducer. This arrangement, developed and patented by Axel Ridtahler shows a considerably lower resonance and is extremely compact. The optimised radiation pattern doesn't correspond to the typical "8" any longer, which is why this type of speaker is not a genuine dipole. To distinguish between a classical dipole and Ridtahler's variation the latter is affectionately called RiPol(e). There are two types of RiPoles: the BMS version - like the one we discuss here - with two bass drivers facing one another and the DRS version with only one bass driver, like described in Hobby HiFi. We would like to point out that it does matter which bass driver is to be employed, which parameters these drivers need to have and how the cabinet is designed. In our example one active BMC RiPole was linked up to one horn. The picture on the left shows the RiPole schematically from the top with the cover removed. The picture to the right shows the protruding magnets (next to Axel Ridtahler's hand) and the opening in the centre. Beneath the subwoofer a resonance decoupler is visible, beneath that a granite plate. a sound that shows less room resonance and standing waves compared to conventional subwoofers. Especially the feature that room resonance and standing waves were less noticeable was impressive. Axel Ridtahler explained the theory behind his sort-of-dipole. The most interesting aspect is that the resonance frequency drops through impedance transformation compared to the same driver not being mounted! This is astonishing since mounting a driver in a conventional cabinet increases the resonance frequency considerably. In this context quite a fashionable loudspeakers system was discussed where the bass driver is operating below its resonance frequency (URPS). However, the alleged advantage of this design could not be confirmed by the audience. Instead, all listeners were enthusiastic about the Ripole's performance. We would like to thank Axel Ridtahler for this extraordinary experience. We'll certainly keep in contact with him to gain more information and obtain more ideas for our DIY community. There is already a heated discussion going on and first results will be available soon. The company Audioelevation, licensee of Axel Ridtahler's patents, is in charge of marketing the RiPole; some RiPole kits are available from us. Copyright © Iris Strassacker 2005. All rights reserved.